For adventure travelers, there are exciting discoveries to be made in the northern reaches of Georgia. The 2,135-mile Appalachian Trail ends here in Georgia on Springer Mountain. The tallest waterfall east of the Mississippi, Amicalola Falls — that’s Cherokee for “tumbling waters” — cascades 729 feet down through the wild high country of the Chattahoochee National Forest. Wineries and wellness spas and Civil War battlefields also invite exploration. But serious adventurers might want to look to two lesser-known Georgias a bit farther afield. Ever contemplate a trek among ancient Caucasian villages in the Republic of Georgia? How about a voyage to South Georgia Island, with its massive glaciers and masses of penguins? The Caucasus Mountains of northern Georgia. A captivating adventure destination is the Georgia that lies on the other side of the world. Dividing Europe from Asia both historically and geographically, the Republic of Georgia is a most intriguing place to explore. Its ancient culture and traditions are the context for its people’s legendary hospitality, and its scenery is on par with any of the world’s greatest trekking destinations. 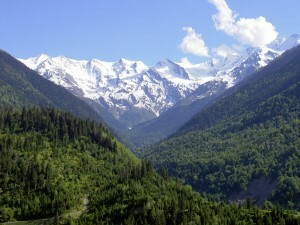 The Caucasus Mountains dominate Georgia’s northern border, stretching in a 750-mile serrated line from the Black Sea on the West to the Caspian Sea on the east. Every bit as beautiful as the Alps, their steep peaks rise over 16,000 feet. Pristine rivers tumble through glacier-gouged valleys, and hardy mountain dwellers live in centuries-old stone villages that cling to the slopes. The region is one of the most biodiverse on earth, with hundreds of endemic plant species, including the world’s only pre-Ice Age flowers. Georgia is a real find for trekkers who want to discover a fresh, little-traveled region. Explorers’ Corner is one of few adventure travel companies offering guided hiking trips through the mountains of Georgia. We camp and stay at local guesthouses in remote villages, where our hosts regale us with song, poetry, food and wine for hours on end. We explore ancient stone fortresses and early Christian churches. We soak in thermal baths. And we marvel at the riches, both natural and cultural, that are the gifts of global adventuring. South Georgia Island, first discovered by European explorers in the late 17th century, is an isolated outpost in the South Atlantic that lies 1,335 miles east of Tierra del Fuego, the tip of South America. South Georgia Island lies 3/4 buried beneath snow and ice. Glaciers wrap more than half the island in ice, with snowfields covering much of the rest, yet the harsh conditions do not deter millions of King penguins from calling South Georgia home. This frigid Eden is also home to more than 2 million fur seals – 95% of the world’s population – and half the world’s southern elephant seals. A quarter of a million albatrosses return here to nest each year, as do 10 million other sea birds. 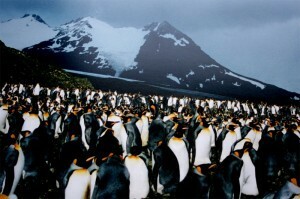 World’s largest King penguin colony on South Georgia Island. Captain Cook was the first known voyager to set foot on the island in 1775, hoping this “huge mass of snow and ice” he’d found was continental Antarctica, but his goal lay 1,000 miles farther south. South Georgia is better known in the annals of a later expedition, that of Sir Ernest Shackleton’s ill-fated Endurance. When Shackleton’s ship and crew, bound for Antarctica, became locked in pack ice on Elephant Island, he set out with five men on perhaps the most daunting journey ever undertaken, to attain their rescue. After sailing more than 800 miles on a lifeboat through some of the planet’s stormiest seas, Shackleton and his small group reached South Georgia. But the whaling station they sought was on the north side of the island, and their damaged boat could sail no farther. They set out to cross the uncharted interior of the island, traversing its icebound, mountainous center, till they reached the station at Stromness. From here, help was available, and every member of Shackleton’s expedition was rescued, 17 months after their initial departure from South Georgia. Contemporary adventurers can be assured of seeing the island under far more hospitable circumstances, though the sense of isolation, the overwhelming landscape and the multitudes of wildlife remain unchanged from Shackleton’s, or Cook’s, day. So which Georgia captures your imagination? Tell us what’s on YOUR mind.